If Bitcoin price history proves anything, it is that this price slump might be far from over. Quickly eroding dominance of Bitcoin is one of its biggest risks. Prices of cryptocurrencies seem to recover after a huge sell-off. But if Bitcoin price history proves anything, it is that this price slump might be far from over. Governments cracking down on cryptocurrency, exchanges having problems, the problems for Bitcoin seem to be a never ending story but seemed unable to stop its price development in the past. The quickly eroding dominance of Bitcoin is one of its biggest risks. If you insist on buying the dip, go ahead, but not do so before reading this article. What this graph shows is that the dominance of Bitcoin is quickly declining. In July 2017 it briefly seemed that Ethereum was about to overtake Bitcoin as the world's largest cryptocurrency, an event which was nicknamed 'the flippening'. As you can see in the graph, the flippening never happened and Bitcoin retained its position as the largest cryptocurrency, but it is down from almost 100% in 2013 to about 35% today. 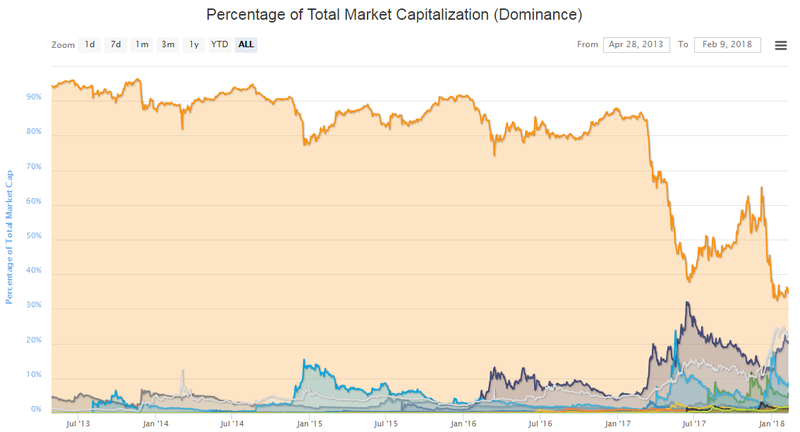 A decreasing dominance does not have to be a problem if market capitalization of cryptocurrency keeps on increasing indefinitely, but on the long term, this is just not going to happen, or at least not at the degree to which it has in the past couple of years. Add to this the fact that Bitcoin is technologically inferior to many other cryptocurrencies, and it does not look impossible that Bitcoin prices could remain stable or even decrease on the longer term from here, even if other crypto's would thrive.